So I’ve been reading all the Sherlock Holmes stories and novels since January now, and I’ve been having a great time with the audiobooks narrated by Stephen Fry (especially since my version also has these little personal essays written by Fry at the beginning of each novel or collection). But I think I might have done myself a little disservice by listening to this one in audio. I’ve read it before, when I was in grade school I think, but the only part I remembered was SPOILERS when they discover the dog had been painted in phosphorous (except my memory translated that to being covered in flour for some reason?) END SPOILERS. The last third of the book I had no trouble with the audio because that’s when the action gets going and the clues all come together, but sometimes with detail-oriented books, my brain kind of drifts away when I’m listening to audiobooks, and I think that’s what happened here during the first half of the book. My brain went on vacation and I missed a bunch of stuff. For future reads, I’m definitely doing hard copy. The Hound of the Baskervilles is one of the most loved crime/mystery books in English literature, and is considered a classic. It’s certainly the best of the three Holmes novels I’ve read so far, leaving both A Study in Scarlet (which has that weird Utah digression) and The Sign of Four (which is mostly forgettable) in the dust in terms of pacing and plot and atmosphere. 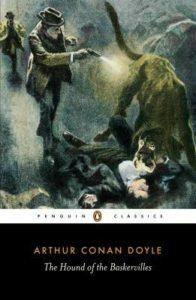 The conflict between the supposed supernatural and Holmes’s strong belief in reason gives a firm backbone to the novel, and the tension builds nicely, culminating in a tense action sequence that is somewhat rare for Conan Doyle. Conan Doyle famously killed off his hero in “The Final Problem” eight years before he began serializing this novel in The Strand. He got around this by setting it 1889, well before Holmes plunged over the side of the Reichenbach Falls with his nemesis, Moriarty. Eight years seems to have been enough time for Conan Doyle to get over his resentment and boredom of the character. The money didn’t hurt either. I think most people are aware of the basic plot of this one: Holmes and Watson are brought in upon the mysterious death of Sir Charles Baskerville, whose body was found on the Moors of Devon. 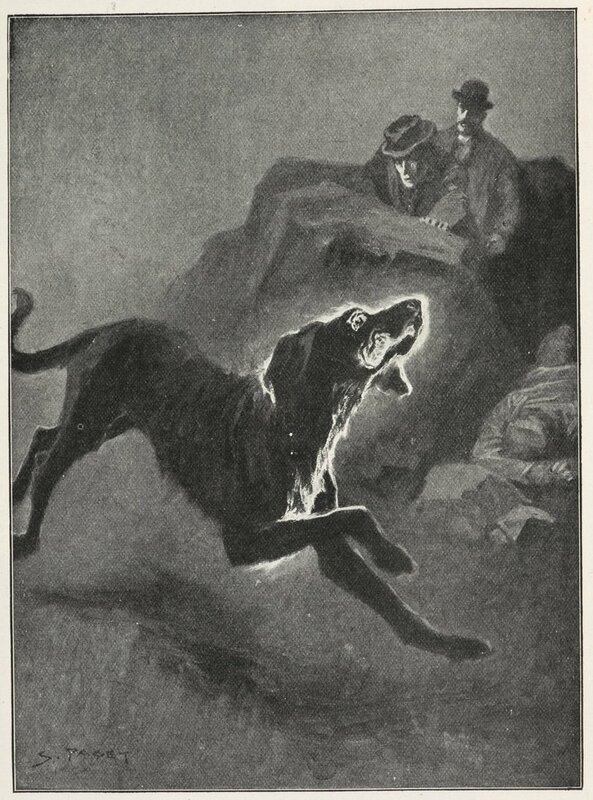 His death was attributed to natural causes, but his good friend Dr. Mortimer believes it may actually have something to do with an old legend that has haunted the Baskerville family for generations, of a gigantic hound trawling the moors, seeking vengeance on the Baskerville line for the sins committed by their ancestor. Dr. Mortimer wants Holmes to find out what’s really going on, and to protect Sir Charles’s heir, Henry. After a series of strange events and almost run-ins with bearded strangers and Sir Henry Baskerville’s left boot repeatedly going missing, Watson is off to Devon to investigate while Holmes is occupied with a prior case in London. 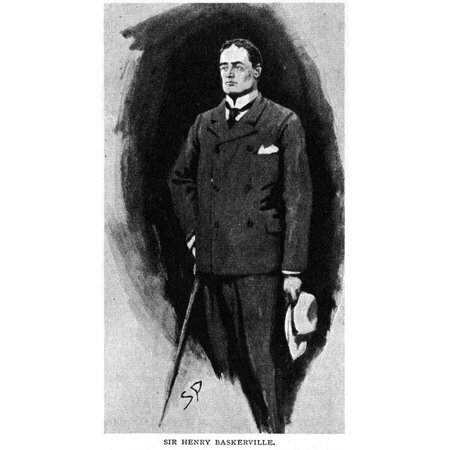 A large portion of the narrative is made up of Watson’s carefully put together reports to Holmes, on the activities and dispositions of Sir Henry’s neighbors. It’s clear that Watson has learned a lot in his time with Holmes, as he observes things about the people he meets he wouldn’t have before, and draws correct conclusions even without Holmes there to egg him on. (This is also where we get the phrase “conductor of light” in relation to Watson.) He has run-ins with lepidopterists, escaped convicts, and shifty butlers. And it’s clear that other things are going on that aren’t being said. I will have to read this again, because I really didn’t pay it enough attention there in the middle, but it’s clear by the exciting ending and satisfying denouement (where Holmes reveals all) that this is a classic for a reason. Share the post "“Mr. Holmes, they were the footprints of a gigantic hound!”"